Edward Copeland's Tangents: I Come to Praise Caesar, Not to Bury Him. I Come to Praise Caesar, Not to Bury Him. Before he was the sharp-minded, fast-talkin' insurance investigator in Double Indemnity or the poker-playin' master who squared off with Steve McQueen's Cincinnati Kid, before he was the traitorous Dathan in the biblical epic The Ten Commandments or the world-weary friend of Chuck Heston who knew the truth about Soylent Green, Edward G. Robinson was the short-statured yet larger-than-life eponymous crime boss in the 1931 Warner Bros. classic Little Caesar, which debuted 80 years ago today. Released the same year as the studio's other gangster pic The Public Enemy, Caesar did for Robinson exactly what Enemy did for its lead actor James Cagney: it made him a star. Based on a novel by W.R. Burnett, the author would later write the novels The Asphalt Jungle and High Sierra. He co-wrote the screenplay for High Sierra (which, coincidentally, was released 10 years to the day that Caesar premiered) with John Huston and also worked on continuity and contributed dialogue to Howard Hawks' Scarface. Little Caesar tells the story of the meteoric rise and ignoble fall of fictional Chicago crime boss "Rico" Bandello (though he's presumably inspired by either Al Capone or Sam Cardinella depending on who you're talking to). While it wasn't the first gangster film ever made (nor even the first "talking" gangster film), Caesar is often credited, along with Enemy, as being the "godfather" of all gangster flicks that followed. It certainly spawned a whole string of mobster parts for Robinson, who would play similar roles in Key Largo, Little Giant and Disney's Never a Dull Moment (my first exposure to the inimitable Edward). Like all typecast actors, Robinson struggled to break free from his "tough guy" screen persona for many years to come and despite his undeniable talent and charisma, it's easy to see why audiences so associated him with that type of character. Edward G. Robinson is to mobsters what John Wayne is to cowboys. To see him play "Rico" in particular is to witness that rare occasion of an actor and a part fusing together with such perfection that it's almost impossible to separate them. Robinson is so graceful, so natural, so believable as the arrogant, power-hungry and bloodthirsty Rico that it's easy to believe that this was the role he was, as the cliche goes, "born to play." Every scene with him is a delight and there are so many memorable moments involving him that it's hard to highlight only one. Nonetheless, my personal favorite is the scene where he tries on a tuxedo for the first time and stands before a mirror. At first he starts off hating the "monkey suit" he's wearing ("All I need is a napkin over my arm," he sneers. ), but gradually he starts to like the way it looks and strikes a dashing pose as he admires his newer, "classier" self. Without a doubt, Robinson is the best part of Little Caesar. The rest of the film, unfortunately, doesn't hold up quite as well. Though by no means bad, one wonders if The Godfather or Goodfellas will look as dated, quaint and melodramatic on their 80th anniversary as Little Caesar looks now. 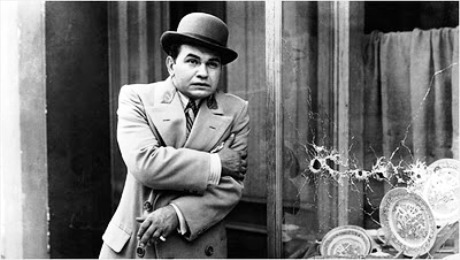 No doubt the violence, ridiculously tame by today's standards, was shocking for its time (a time before the Hays Code swooped in to protect audiences from being sullied by such despicable sounds and images) and the idea of glamorizing the Mafia lifestyle — an element that is not only accepted by today's audiences but actually expected by them — also made the film rather controversial (though it didn't hurt its box office intake). In fact, when the film was re-released in 1954 on a double bill with The Public Enemy, a foreword was added in an attempt to give it some "relevance." Jonathan Munby (author of Public Enemies, Public Heroes) calls the foreword a "disclaimer couched in the rhetoric of the officiating culture." My advice is to forget about its tacked-on socially redeeming "message" or its historical import as an early example of "crime drama" cinema. 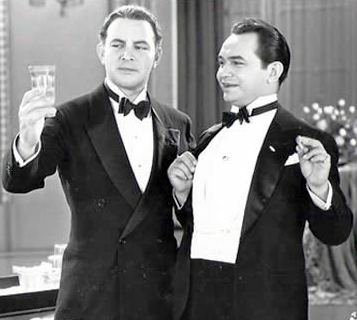 The real reason to see Little Caesar is the iconic performance of Edward G. Robinson. The ambition, the brutality and the occasional vulnerability he brings to the character of "Little Caesar" will ensure that that little man (and by connection the film he inhabits) will live on long after the Pizza franchise has become only a memory. So, to answer Robinson's final query: "Mother of mercy, is this the end of Rico?" Not hardly, Ed. Not hardly.